"Visualizing Instagram data: selfies, cities and protests"
How can we explore patterns in massive amounts of visual, user-generated content such as the billions of images and video on Instagram, Facebook and Twitter? How to democratize data mining so such research can be done by designers, artists and students who don’t have computer science degree? 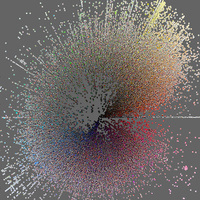 How do we analyze social media data without thinking about "typical," "popular" or "outliers"? How to use "big data" to question our assumptions about cultures and societies? The Software Studies Initiative (softwarestudies.com) was established in 2007 to begin working on these questions. Dr. Lev Manovich will show a number of projects created in his lab, including recent work created for New York Public Library, MoMA and Google. The projects to be shown include comparison of 2.3 million Instagram images from 13 global cities (phototrails.net), an installation exploring Broadway street in NYC using 30 million data points and images (on-broadway.nyc), and an analysis of 1 million artworks from the largest network for “user-generated art” (deviantart.com). Dr. Manovich will also talk about his current work in progress - an analysis of 265 million images shared on Twitter worldwide between 2011-2014. Dr. Lev Manovich is the author and editor of eight books including Data Drift (RIXC, 2015), Software Takes Command, (Bloomsbury Academic, 2013), Soft Cinema: Navigating the Database (The MIT Press, 2005), and The Language of New Media (The MIT Press, 2001) which was described as "the most suggestive and broad ranging media history since Marshall McLuhan." Manovich is a Professor of Computer Science at The Graduate Center, CUNY, and a Director of the Software Studies Initiative that works on the analysis and visualization of big cultural data. In 2013, he appeared on the list of "25 People Shaping the Future of Design". In 2014 he was included in the list of "50 Most Interesting People Building the Future”. Sponsored by the School of Art, Media, and Technology.